Domain names are the base, but mobile phone service contributes the most gross margin. 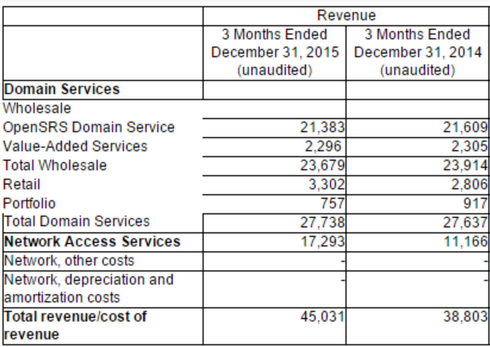 Tucows, one of the largest domain name registrars, released fourth quarter and full year financial results yesterday. Fourth quarter revenue hit $45 million, with annual revenue of $173 million, up 17% from the prior year. While the company’s domain name business remains the biggest component of its revenue, all of the growth is coming from its Ting mobile phone service. And, for the first time, gross margin from its mobile phone business topped the domain business in Q4. If it weren’t for Tucows’ retail domain name business (Hover), revenue from the domain business would have been down in Q4 2015 compared to the same quarter the year before. The company also authorized the repurchase of up to $40 million of shares over the next 12 months. Do you know if ‘portfolio’ means their domain portfolio sales? Juan, this is all revenue from their portfolio. It includes sales and parking revenue.